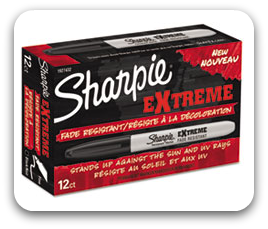 Extreme ink resists fading when exposed to UV rays, rain, snow and mud. Great for outdoor gear and sports equipment. Sharpie delivers bold color that can be used on most surfaces, including plastic, glass and wood. Marker Type: Permanent; Color: Black; Tip Type: Fine. Bold colors and extreme ink: resists fading when exposed to UV rays, rain, snow and mud. Great for outdoor gear and sports equipment. Can be used on most surfaces, including plastic, glass and wood.